Over the last decade, the increased construction in Spain has left empty housing developments, unused airports and a huge debt that the rest of Spaniards have now to pay. But nearly all that concrete has been poured into few places: around the main cities, the Mediterranean coast and islands. There is however another Spain where nothing much has happened and is there for everyone to see. If you there to drive off the main roads, you find these silent villages cascading from mountains or buried down in valleys: ruined adobe houses, empty fields, stork nests, scorching sun in summer and biting cold winds in winter. Most have been dying since the 1950s and '60s, when rural poverty drove mass emigration to the cities and abroad. A few old people still hang on, growing their cabbages and leeks. Harsh climates are often exacerbated by a lack of trees. However, there are some architects who are trying to design houses and buildings, to integrate into this forgotten part of Spain. Designing houses that requires that an adequate dialogue be established between man and nature, so that they integrates in the place where it is built and does not alter the natural environment. It is increasingly common to build houses that follow the principles of ecological architecture in Spain, using various solutions to achieve an increasingly reduced consumption of energy and a better integration in it is own environment. 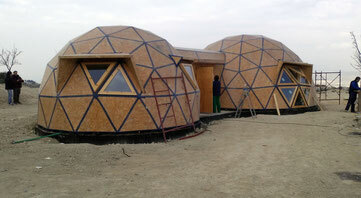 An area of 85 square meters and two geodesic domes, has no electricity or water supply and uses renewable energy and a water purification system. It is a 100% self-sufficient house. All the materials that have been used in its construction are natural: wood, lime mortar, natural cellulose, etc. An abandoned barn was rehabilitated and a house completely integrated in its surroundings was built. Electric power is generated with solar panels and hydraulic turbines that take advantage of the current of two streams. The design adapts to the landscape and uses the materials of the area. The house has a swimming pool and the water in that pool is used to irrigate the lawn. 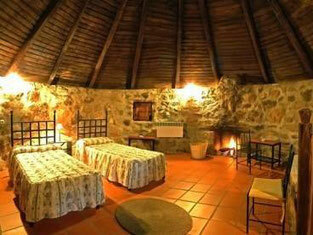 It is located east of Madrid and stands out for an energy consumption almost equal to zero. To live in this house, it is not necessary to contract the electricity with any electric company. Another curiosity of this house is that it has a special ventilation system through which it is not necessary to open the windows, allowing to maintain the temperature in summer and in winter. 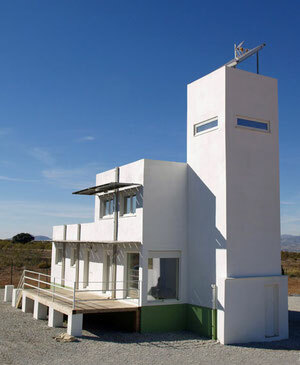 It is a single-family house that has managed to generate more energy than it consumes. It was built on recycled boat metal containers. The insulation of the house is made of rock wool and polyurethane, and special care has been taken with thermal bridges. In addition, this house has obtained the first Passivhaus certificate, granted by the Passivhaus Institut, which certifies that the home meets all the requirements of the Passivhaus standard, an energy efficiency standard whose main objective is to reduce the energy requirements of buildings. This design reduces the impact on their environment with a minimum occupation of the ground and respecting the surrounding vegetation. The house is oriented to look for the sun in winter and to protect itself from it in summer. The concrete walls contribute to the insulation of the interior. In addition, the house has the most advanced technologies for saving water. These are just some examples of self-sufficient housing in Spain, but there are many more, because the ecological architecture is a trend that has come to stay and give us the chance to find our place in nature.